Plastic pallets have been in industrial use for decades now. 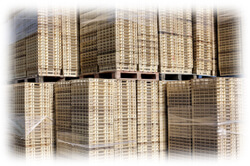 They provide the benefits of being more compact and lighter than the conventional wooden pallets. They are also easier to clean than the wooden ones. In the food industry, they are beneficial in terms of providing a food-borne bacteria free environment as compared to wooden pallets that can house insect pests in them that can ultimately infest food products. There have now been regional and international restrictions on the use of wooden pallets. However, in terms of strength, these pallets are still preferable over plastic ones. They are formed in many different ways. Some are molded from plastic while others are made from resin or petroleum-bases products such as polyethylene. They are easily recyclable and thus are safer for the environment as well. Cleaning them requires correct understanding of the factors that increase the efficiency of cleaning without damaging the plastic. High pressure washers ensure proper cleaning but too much pressure may cause damage in its usage over time. Thus, heat is another crucial factor in cleaning efficiency. High pressure, mixed with the ambient heat can result in optimum and deep cleaning for plastic pallets. There are several manufacturers of plastic pallets cleaning systems. Cherry’s Industrial Equipment Corp. makes ‘entry level’ pallet cleaner which attaches to an existing compact pressure washer and is known for its compactness. It is made of stainless steel and contains a reservoir for waste water collection as well. The company also makes conveyor systems. Proceco is another manufacturer of washing systems. Their system uses a hot watery cleaning solution for removal of all sorts of materials such as oil from machines, dust from transport and metal chips. With not many patents in its cleaning industry, many manufacturers are adding new cleaning equipment in their arsenal. However, some manufacturers use custom-designed pallet cleaning systems. For example companies like HW management, LP Findlay and OH offers pallet washing with a custom machine that has 52 spray jets that dispense water at 2.5 GPM at 170 °F and 65 PSI. They also offer complete logistics and warehousing facilities as well. However, due to several kinds of plastic pallets in the market, a customized machine may not always be suitable for all sorts of washing purposes. The ‘odd-ball’ pallets are where the contractors can enter the pallet-washing market. Government entities such as the Food and Drug Administration (FDA) and US Department of Agriculture (USDA) have set out standards that need to be followed for its cleaning. They also set requirements for pallets that need to be reused. Wood pallets provide strength in weight bearing and flexibility and thus they are preferred in some industries such as heavy materials transportation. Here, these pallets are hardly used. However, due to their growing success, ease of use and repeated usage and other benefits highlighted above, they continue to make their mark in the market and have gained a steady pallet market share of around 5%. Although some time and money needs to be invested before one can decide to enter the plastic pallets cleaning industry, one must also keep in mind the benefits and the opportunity this growing industry offers.